Our experience indicates that video production projects have a strong potential to actively engage students, reinforce and expand upon science content learned through conventional pedagogical approaches. Adding a video production component to a unit of inquiry offers an effective means to bring active, social, and affective learning in a wide range of instructional environments. 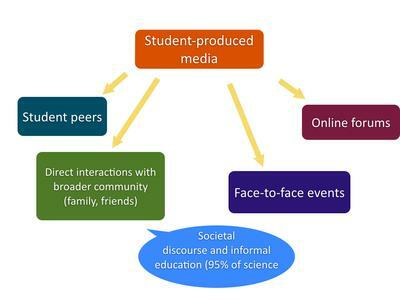 Through out the Climate in the Age of Media project we found that these lessons overcome many of the challenges that climate change education presents. The final output - a video communicating climate change science - is only the culminating phase of the project. This product is the result of a multistage process in which students synthesize data, concepts, and ideas informed by scientific research in order to communicate with a larger audience. Original scientific research or laboratory exercises can be integrated into media projects or for shorter or less advanced projects, students can be provided with an accessible, brief description of scientific content and focus their pre-production work on understanding and conveying science concepts in a compelling manner. Instructors calibrate the research phase according to the grade level and scientific expertise of the students. The pre-production phase of a video project includes research, analysis, synthesis, writing, and planning. It is the foundation of a media project and can be tailored to fit many curricula and learning goals. Pre-production incorporates critical thinking, creativity, affective processing, time management, collaboration, and social learning. 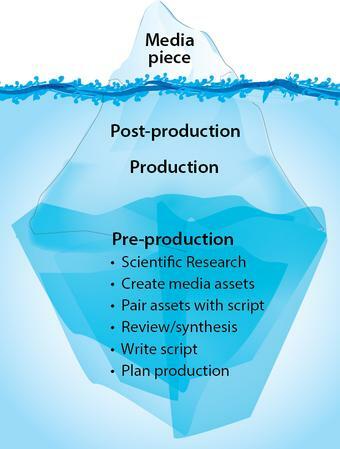 Before completing pre-production students must gain sufficient mastery of climate change science concepts to convey essential ideas in creative and compelling ways. This stage contains several opportunities for formal and informal formative assessment. Working collaboratively in small groups, they research and plan visual and audio assets, pair those assets with their script through a storyboard or shot list which will guide the next stage of the project: Production. Who is their target audience? What type of communication approach and aesthetic style will appeal to them? What information does their audience need? What is the core idea that they want to communicate? What misconceptions are common in this area? How will this project clarify the science? What behavior are they hoping to change (what is their 'ask')? During production students use their plan (script, storyboard, shot list) to create and gather audio and visual assets (images, graphics, filmed scenes, narration, music and sound effects, etc. )Time management, task delegation, individual responsibility, and leadership are all required for this phase of creative, hands-on, and time-consuming work. Frequently, major project revisions occur, as students continue to discuss, brainstorm, critique, and clarify the delivery of content in their project. Once production is finished and all images and audio have been gathered everything is brought together, integrated, synthesized, assembled and edited and reedited into a single coherent informative and aesthetic piece of communication. A major component of post-production is video editing, an iterative process in which visual and audio content is reviewed and manipulated to create a coherent and compelling final product. Editing offers opportunities for learning through continued group discussions, group work, and review of scientific concepts. This fourth stage of production punctuates the potential impact of student video production. Unlike a test which remains in the hands of the student and instructor, video productions are meant to be shared publically. Students can assess for themselves whether they met their goals; Did they reach their target audience? Was the information clear and complete enough? What questions arise from an audience after seeing the video? Within a classroom, videos are natural 'jigsaw' learning tools, enabling students to educate each other. When videos are screened (either within the a classroom or beyond it), they can serve as an effective means to stimulate discussion and offer yet another opportunity for students to lead discussions and take on the role of an expert in their project's focal area and clarify subtle details.